Melissa's Blog: Ella Publishing Deal! I just had to share this awesome deal with you! 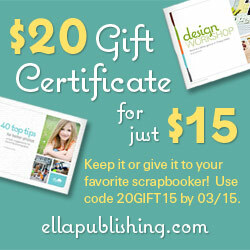 Ella Publishing has beautifully designed scrapbooking and photography ebooks. Get a $20 gift certificate to ellapublishing.com for just $15! Use code 20GIFT15 by March 15, 2011. Use the gift certificate yourself or give it to your favorite scrapbooker.